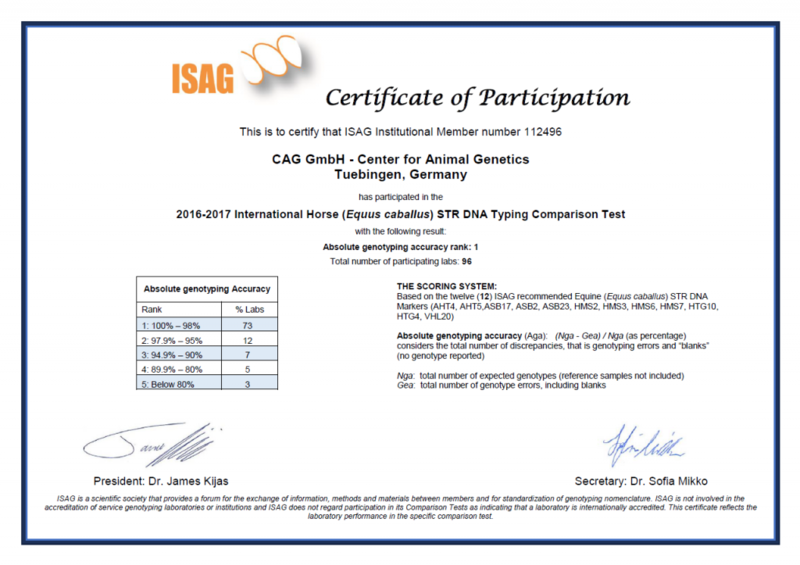 CAG GmbH, the Center for Animal Genetics was jointly founded in July 2014 by CeGaT GmbH and dw sport horse GmbH. This partnership brings together CeGaT’s award-winning expertise in molecular genetics, sequencing, and data analysis and dw sport horse’s experience in the world of horses and animal breeding. The corporate objective is to conduct ground-breaking molecular analysis of animal genetics and hereditary diseases, especially in horses, dogs, and cats. In addition to on-going research, CAG offers traditional identity and parentage testing, and existing single-gene disease and phenotype tests. CAG collaborates with academic laboratories, breed groups, and breeders, and also offers services such as next-generation sequencing (NGS) of various animal species. CAG’s research reflects the leading edge of molecular genetics, working to predict simple and complex hereditary diseases and traits. Many diseases in horses, dogs and cats are still unexplored and their underlying cause unknown, particularly for multi-factorial conditions that include multiple genes and environment factors. CAG focuses on this area, contributing to basic research in the field to improve knowledge and resources for animal breeders and owners and will develop resources to improve the health and well-being of animals. Tests offered and developed by CAG will give breeders the tools they need to reduce the occurrence of undesirable traits through selective breeding and to confidently choose top quality animals for their breeding programs. Scientific Lead Dr. Melissa Cox is specialized in animal genetics, having earned her doctorate in Genetics through the Department of Veterinary Pathobiology at Texas A&M University, and has concentrated on comparative genomics with an interest in domestic animals throughout her career. She has also been a consultant for animal breeders and worked with various breed organizations and registries in educating members and helping set up programs for genetic improvement in breeding programs. In September 2016 she was elected as the Industry Representative for the Horse Commission of the EAAP (European Federation of Animal Science) in Belfast. CeGaT GmbH, Tübingen (Germany), was founded by Saskia Biskup, MD, PhD, and Dirk Biskup, PhD, in 2009. The basis of CeGaT’s success is an established high-throughput process for the use of next-generation sequencing (NGS) in diagnostic testing and the up-to-date knowledge of hereditary genetic diseases. CeGaT is a diagnostic company which is renowned for identifying the pathogenic gene variation of a patient. Single gene testing (which was state-of-the-art until 2010), would not detect the causative gene variation in 80-90% of all cases. Consequently, CeGaT has invented and established Diagnostic Panels: By simultaneously sequencing all genes associated with a certain disease using next-generation sequencing platforms, the probability of finding the causative gene variation is extremely high. In addition, this approach is much faster and considerably less expensive than classical gene by gene sequencing. 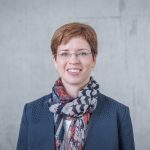 CeGaT was awarded best German Start-Up Company in 2011, was a Top 3 finalist in Boston Children’s Clarity Challenge 2012 (and the only participant worldwide to correctly flag every likely genetic mutation in all three families), and was awarded Entrepreneur of the Year 2013. Today, CeGaT has more than 80 employees and a subsidiary company B. Braun CeGaT, LLC in the United States. Buying a horse is a matter of trust. dw sporthorses GmbH (DWS) sees itself as a unique matchmaker between prospective customer and the perfect sport horse. Clients benefit from DWS’s many years of experience in sport horse breeding and competition, and an impressive network of contacts to breeders and trainers. Horse and rider must be properly matched in order to form a strong partnership. When approached by a prospective client, DWS gets to know the individual’s needs and wishes in order to help find the perfect partner, assembling a tailored selection of talented sport horses for evaluation. The impeccable origin of horses and strong cooperation with reputable breeders and private sellers are fundamental. DWS offers personalized advice and support throughout this process. In order for the client to concentrate on evaluating horses DWS takes care of everything else: arranging travel plans and hotel reservations, organizing try-outs with appropriate horses, and arranging vet checks. Offering knowledgeable advice, DWS supports the client through to the purchase of a horse and organization of its transport to its new home. Client satisfaction is paramount, even after the sale. dw sport horses GmbH will provide further support on request and is always ready to answer all questions on the new horse. dw sport horses also breeds its own sport horses for performance and health, incorporating the latest scientific findings in equine genetics. Quality Control is of the highest priority. The in-house laboratory is DAkkS Accredited for DIN EN ISO 15189. 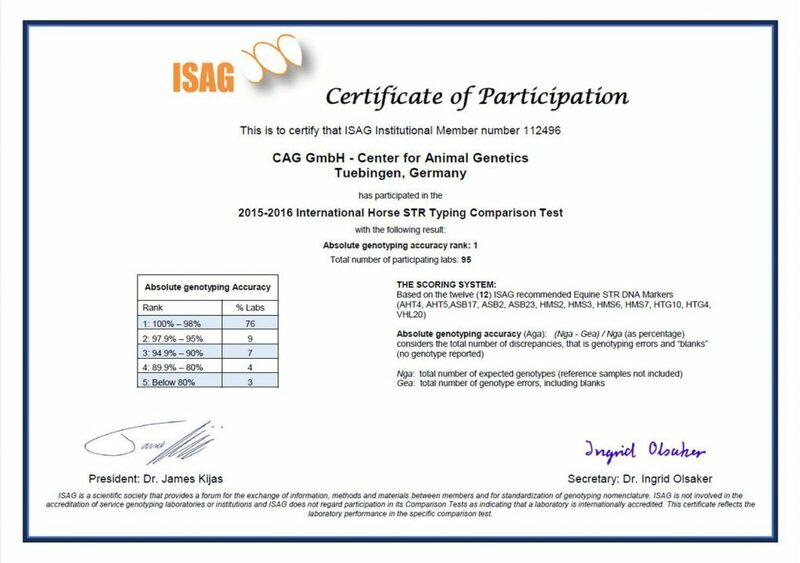 CAG also takes part in the official Comparison Tests administered by the International Society of Animal Genetics (ISAG) for Identity and Parentage testing for dogs and horses. Comparison tests, also known as circle tests, are a way for laboratories to measure their laboratory accuracy. 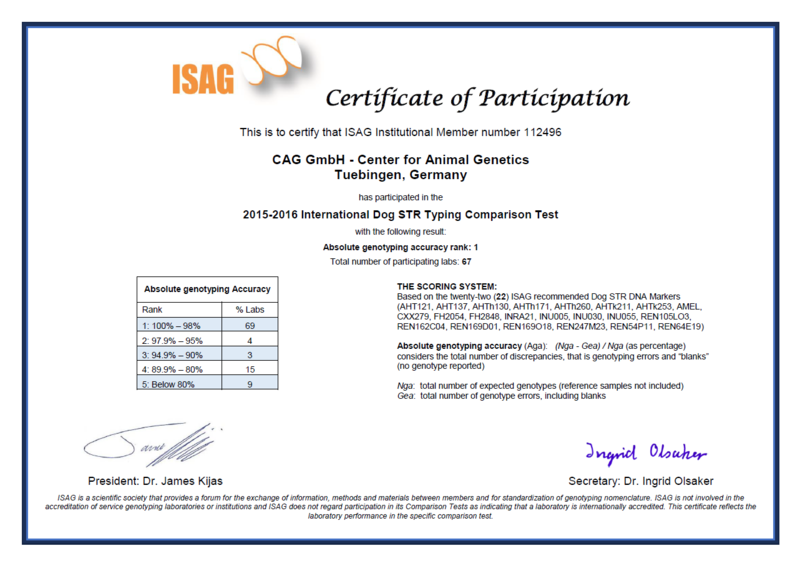 A central organization, such as the International Society for Animal Genetics (ISAG), sends the same samples to all of the different laboratories that apply to take part. All of the laboratories then run their tests (in this case, the STR Typing test is the test used for Identity and Parentage testing), and report their results. The organization checks the results, and lets the laboratories know how they performed. It is an important way for laboratories to assess their accuracy and quality standards, and CAG is pleased to see that our top quality standards continue to ensure correct and reliable results.